This pasta version of the Italian classic gets a tasty twist with peppery arugula standing in for basil. In a large bowl, whisk the lemon juice, zest, olive oil, salt and pepper. Add the mozzarella, tomatoes and arugula and toss. Cook the rotini according to package directions until al dente; drain and rinse with cool water, then drain again. Add the pasta to the bowl and toss to mix. Serve immediately, or refrigerate for up to three days. 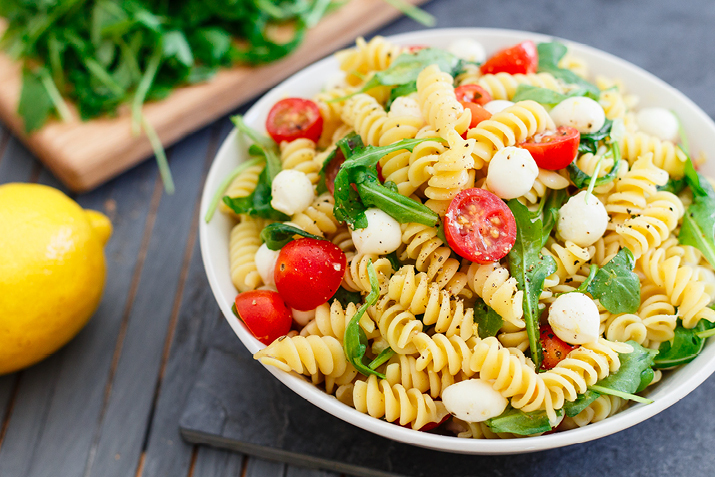 In this easy pasta version of the Italian classic, the Caprese becomes a meal, gets a little sparkle from lemon, and can be made anytime of the year by using arugula instead of basil. Great for potlucks, since it travels well.